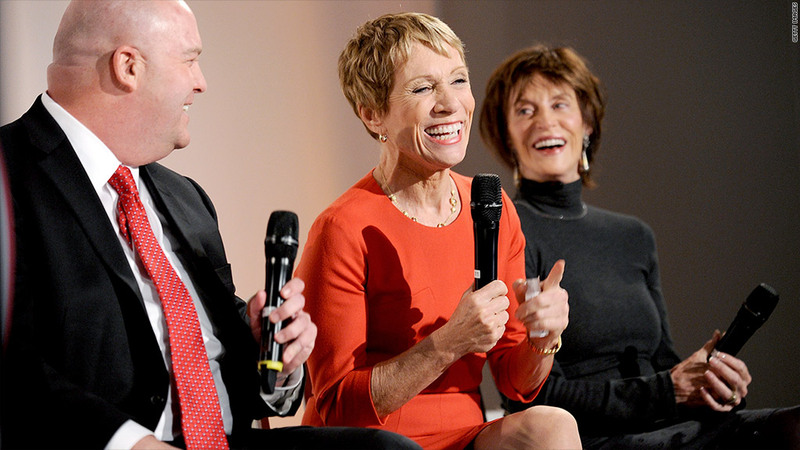 Barbara Corcoran, center, called failure her "sweet spot." Investor, real estate mogul and millionaire Barbara Corcoran sees a silver lining in bad news: When positive things have happened in her life, it's always on the heels of something terrible. She shared her perspective at a recent New York City summit celebrating American manufactures. "Failure is what I'm best at," she said, calling it her "sweet spot." Corcoran is a businesswoman and an investor on the ABC show Shark Tank. She often recounts that in 1973, she was working as a waitress when her boyfriend, Ramone Simon, offered her a $1,000 loan, suggesting they go into business together. "You know I almost didn't do it because I was afraid? What the hell was I thinking? Lose my job? As a waitress?" She told the crowd at the event, which was hosted by Martha Stewart. Seven years later, Corcoran and Simon had built a business that included 14 real estate rental agencies in New York City. Then Simon came home and said he was going to marry her secretary. "I thought I would die," she told the crowd. "And I really thought about giving up." Instead, she took half the business and seven salespeople with her. As she walked out the door, Simon said to her, "You know you'll never succeed without me." In 2001, she sold The Corcoran Group for $66 million. But even after selling her business, Corcoran struggled to find a new path. In 2008, she tried out for "Shark Tank." Although she was initially hired, just days before she was set to fly to Los Angeles for the job, the show said it had gone with someone else. Not to be deterred, Corcoran wrote an email to the producer. "I understand you've asked another girl to dance instead of me. Although I appreciate being reserved as a fallback, I'm much more accustomed to coming in first." She went on to detail times in her life when she'd been rejected or dismissed. "I consider your rejection a lucky charm," she wrote. Corcoran ended her email by saying she'd booked a flight to L.A. and would like another chance. She got the job, and the show premiered in 2009. She has since invested in over two dozen businesses, and some of her entrepreneurs are the show's greatest success stories. In 2012, the show was nominated for an Emmy.